Dublin born doctor and adventurer Barry O'Meara's most famous patient was Napoleon Bonaparte, then exiled Emperor of France; who he treated and chatted with for many years on the remote rain swept South Atlantic island of St Helena. From Blackrock in Dublin, O'Meara studied medicine at Trinity and then spent some years living at Lissaniskey House near Nenagh in Tipperary before he set out for adventure in the Napoleonic Wars with the 62nd Regiment. During his military career, the good doctor once scaled a 200 foot cliff face in Sicily to help wounded men under siege at Scylla Castle. He managed to get 49 stretchers down the cliffs to Messina without loss of life before the castle was abandoned to the French. Later he and an Irish friend were court martialled and cashiered from the army after being caught setting up an illegal duel with another party. The doctor sailed to Malta where he joined the British navy and served on the Victorious when they captured the French flagship Rivoli and later on MS Bellerophon when Napoleon surrendered at La Rochelle in July 1815. Napoleon was charmed by the Irish doctor who spoke French and Italian, to the degree that he requested that Dr O'Meara become his personal physician at St Helena where the Emperor was headed to final exile. O'Meara was asked by the British and agreed only on condition that he wouldn't spy on Bonaparte. On St Helena, despite miserable conditions, Napoleon was upbeat and chatty. For more than three years they discussed politics, warfare, women, medicine, sport and the Irish - Bonaparte was critical of splits in the United Irishmen exiled in France. Napoleon requested that his doctor keep a diary of their chats stating: "Doctor, it will make you a fortune but please don't publish until after I am dead." The Emperor's end would not be far away and O'Meara became increasingly aware that his charge was becoming unwell. Fearing for Napoleon's life, he lobbied London intensively to bring the Emperor back for treatment but without success. The British resented the closeness of the two and brought O'Meara home in 1818 where he continued to pester for specialist treatment for his ailing friend. His case was not only turned down but his refusal to agree to keep Napoleon's illness a secret saw him thrown out of the navy and his name struck off the medical register. His prognosis was correct. Napoleon died in 1821. Some assert the British poisoned him, some diagnosed deadly wallpaper containing high concentrations of arsenic. In either case, O'Meara's book was published, became an instant bestseller and made him a fortune. He spent the rest of his days a wealthy man in London. Last month, Sheppard's put on sale an 1882 painting by his Carlow born grandson, impressionist Frank O'Meara, which was disposed of in the contents sale of Lissaniskey. The house itself has now been placed on the market with agents Savills seeking offers in the region of €475,000. There's not too many parts of Ireland in which you can buy a 10-bed, four floor Georgian mansion for less than €500,000: the price of an average enough city four-bed semi. In total it measures 7,642 sq ft, or six times the size of a semi. 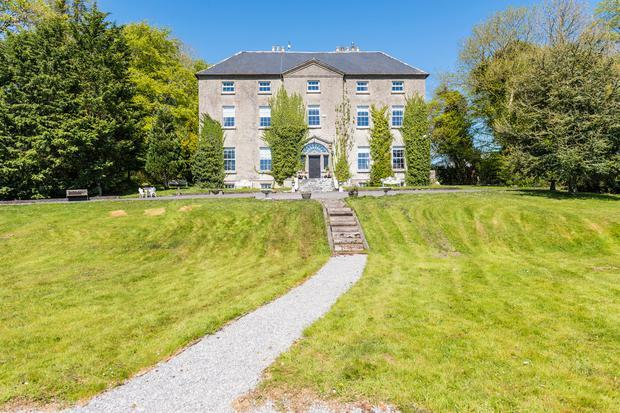 Lissaniskey was built circa 1770, and at the contents auction Mr Sheppard noted that Dr Barry O'Meara is believed to have resided at the house sometime in the late 1790s to 1810. It's unusual in that it has an extensive basement with three floors overhead with a hipped natural slate roof. The centre bay protrudes to give a pediment at roof level. At entrance level is a long hall lit by a very wide fanlight over the main door. On this floor are the two main reception rooms along with the kitchen and pantry. Below ground is the sort of extensive cellar which was once vital to these houses and likely housed the service kitchens back in the times it was built, along with a series of larders, meat storage rooms and wine cellars. There are six rooms in all at this level. On the second floor is the sitting room, likely to have been the social hub of the house for many years and offering views across its grounds. Also here is the main bedroom and connecting ensuite. There are three more bedrooms on this floor with a main bathroom. Upstairs on the top floor are six more bedrooms and a bathroom. The house has plenty of its original features intact including the central staircase with its elegantly turned balusters. Lissaniskey House comes with 10 acres and the grounds include the walled garden, at one time a cornucopia of expert food provision for the house. It was here that a team of apprenticed gardeners would have grown flowers for the tables and herbs, vegetables and fruit for the kitchens. Examples restored somewhat towards their original function can be visited today at Kylemore Abbey in Galway and at Powerscourt in Co Wicklow. Near the house is a complex of modern and period farm buildings around a courtyard area. The grounds have been divided into formal gardens, wooded areas and paddocks. It's located off the M7 outside Toomevara, about halfway between Toomevara and Nenagh. Fishing, boating and sailing is offered on Lough Derg, one of Ireland's largest lakes and the house is located within the premier Tipperary hunt country. The house is in need of some renovation which is likely to cost a considerable amount but the prize is an elegant Georgian country house of character and history.